In the middle of the ocean, explorer and game designer Stefan Feld discovered new land, maybe while he was doing research for Amerigo. The island of La Isla is smaller than the Americas, uninhabited and without much in the way of exploitable resources. No gold, no oil, no diamonds. But La Isla has a different kind of wealth. The small island is home to a number of animal species that have long been thought extinct, like the Dodo and the Giant Fossa. Lets hope they won’t soon be extinct again, because your goal in La Isla is to take a small team of explorers to the island and collect those animals. At least your explorers don’t go hunting for the animals with guns and cooking pot. They catch animals by surrounding them, and since we’re talking about small animals, lets hope that means they’re catching them alive. They might even try to reintroduce them in other places to keep the species alive, but that would happen in another game. Surrounding the animals is a straightforward operation: each round, you place one of your explorers on the island or move one that is already there. 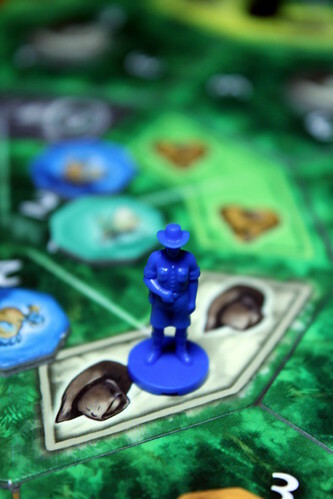 You have to pay two resource cubes of the color matching your destination field, and if you end up with a piece of jungle fully surrounded by your explorers – which takes from two to four of them – you take the animal tile from that jungle. You also score one point per explorer that was needed to surround the jungle, but the majority of your points will come from the animal tiles later, either through the score multiplier or from having full sets of all five animals. Mr. Feld may have discovered an new land in the sea, but with the game La Isla he is in familiar territory, always looking for ways to balance luck and strategy in his games. 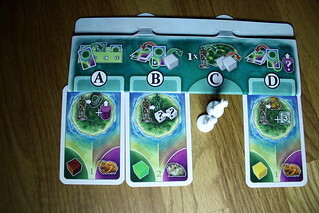 The vehicle of luck and the driving force of the game are cards this time, and the strategy behind them is what to use each card for, because La Isla‘s cards have three different functions: you can use them for their special function, to gain a resource cube, or to increase the score multiplier for one type of animal. Each round, you receive three cards. Three cards, three functions, you can probably guess it’s not a coincidence. You must pick one card for each function, all players do this at the start of the round. Then all players reveal their first card, the card to use for its special function. That card goes to the player’s card holder and allows him to use the special function as long as it is visible. The card holder has space for three cards, so starting in round four you’ll have to cover up other cards. The specials you have at your disposal thus change with every round and you have to adapt your strategy accordingly. Most of the specials let you do something extra when you take certain actions. You might gain extra points when you take the right color or resource, you might take an extra resource when you increase the score multiplier for one kind of animal, or you might increase a score multiplier when you place an explorer on a field with the right symbols. Some cards have a more direct effect, too, and may grant you an extra explorer figure – which is nice, but not as powerful as you might think – or let you draw an additional card each round, which is more powerful than you’d think. Picking specials that work together with the ones you already have and matching your actions to your specials is key to victory: if you can win extra points or extra resources every round, that’s a big advantage over your opponents. But it’s obviously not as easy as that. First you have to actually draw cards that work well together, and then you still have other requirements to consider. The second card each round lets you take one resource cube of the given color. You need the right color of resources to place your explorers where you need them, so maybe taking the right resource is more important than picking the best special. Then again, maybe it isn’t. The third card of the round increases the score multiplier for one of the five kinds of animals. I don’t have to tell you that score multipliers are great, if you can collect many Sardinian Pikas and bring their multiplier up to the maximum of five, that’s a whole lot of points. But is bringing that multiplier up right now more valuable than taking the green resource you will need next round? Or more valuable than the ability to take a green resource every time you increase the Pikas’ multiplier? Those are the big questions you have to answer when playing La Isla. Of course, what happens on the very pretty game board is important as well, that’s where you get your points from, after all. But you win or lose La Isla by assigning your cards to the right spot. Unfortunately, that is not always possible without a healthy dose of luck. Without the special to draw more cards, you have exactly the number of cards needed for a round, and you never have any way to keep cards for later. You will have turns where none of your cards really have what you need. Dealing with that is part of the whole “managing your luck” deal that is the basic idea in all of Stefan Feld’s game, but in La Isla, bad luck can screw you over more than usual. If you never see any specials that let you take extra resources, then you’ll have rounds where you can’t move an explorer and can only watch in frustration as your opponents move and pick up animals. Likewise, if all your cards increase the multiplier of an animal that other players collected more than you, you’ll understandably be unhappy. Don’t get me wrong there, La Isla is not a pure game of luck where you have no influence over your fate. But it can turn from managing your luck to being at the mercy of your card a bit to easily for the type of gamer’s game we have come to expect from Ravensburger’s alea brand (and from Stefan Feld). With its balance of luck and tactical decisions and its light rules – at least for an alea game – La Isla makes an excellent family game, and I don’t see a reason why it wouldn’t work with kids of eight years instead of the publisher-recommended ten. The status as a family game is further reinforced by the lack of options to get block another player in any way. The only way to mess with another player on the board is to pick a tile they wanted, a move that they can see coming long in advance. You can’t even block a field for them because more than one person can be on the same field. The most interaction comes through the score multipliers and taking the same animals as another player to profit from their multiplier. 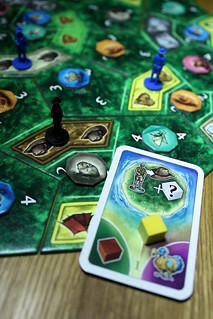 La Isla quick to explain, quick to play and has very little waiting time, even if you have players prone to overthinking their moves. The only kind of player that may have some trouble with the game are those wearing glasses, the player aids explaining the many different specials are inexplicably small and hard to read. Come on, would it be so much more expensive to print them at twice the size? La Isla may not be the next Macao or Puerto Rico, but it is a fun way to spend a sunday afternoon, and one that you can involve the kids in, too.